The Twister™ jar is designed to blend your thickest recipes, such as nut butters, hummus, baby food, dips, thick shakes, dressings and more! Fill up the Twister Jar up to the max (it says on the jar) with nuts. In this recipe we use peanuts for making a yummy penaut butter. You can place the lid on the jar and turn on the blender. Use a manual setting instead of an automatic one, this would not work well for this blend! The Blendtec Designer 625 and 725, as well as the Blendtec Pro 800 and Stealth 875 have a slider for the speed on the touch display, from minus to plus so you can manually change the speed from slow to faster. The Blendtec Classic 575 for example has buttons with different speed levels. 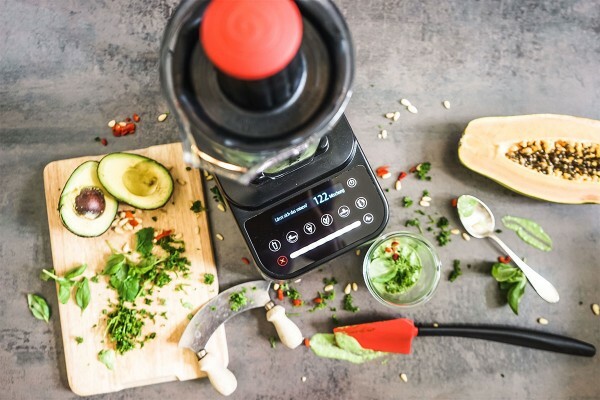 Start your Blendtec Classic therefore with the slowest speed level and if needed, blend faster. The right speed is very important, because Blendtec blenders start with 25000 rpm. So that all nuts get into the blade, turn lid counterclockwise while blending. This will cause all nuts that were stuck on the walls of the jar to get back into the mix! Now you can slowly add more speed to it and you will notice that the consistency changes as it blends faster, because the blend gets warmer too with more speed. Be careful not to blend too fast so it doesnt get too hot either. The peanut butter would be done when you can see a slight oil layer at the top of the mix, then it was successful and you can enjoy your peanut butter on toast or add it to previously made ice cream etc. To make a delicious pesto in your Twister Jar, you handle it the same way as with the nut butter. But since pesto needs more fluid, it is farely easy to make it. It is important that the greens always come in last. So the blend is quite fluid which is able to blend the greens better when they come down to blend. If it stops blending, just add a little more fluid to the pesto. Simply add more oil or water. And your pesto is done! From an order value of 100 £, the shipping within UK is free of charge. Personal data & all payments are transferred via secure SSL encryption. If there is a problem or a repair is necessary on your device, we can and may help! The exclusive and free MYBLENDER Club! Become a member and do not miss any news or action.